John Frederick, champion of the North Fork and a founder of the North Fork Preservation Association, died today following a long illness. John passed away peacefully, his final weeks filled with the affection, laughter and tears of friends, family and well-wishers. Here is John’s obituary, written by long-time friend and North Fork historian Lois Walker. We’ll post additional information as it becomes available . . .
Long-time Polebridge resident and champion of the North Fork, John Frederick, Jr., passed away on November 15. He was 74. He was born in Columbus, Ohio, in 1943, to John and Betty Watson Frederick. He attended school in Marion, Ohio, and graduated with a bachelor’s degree in English from The Ohio State University. He served in the U.S. Army from 1966 to 1969, stationed for almost two years in Alaska. John moved to Montana in 1976, living first near Olney and then at Rogers Lake. 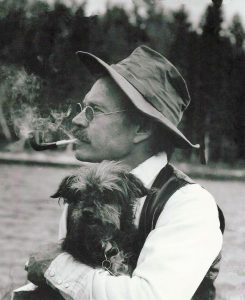 In the fall of 1978, he and his former wife purchased a residence in Polebridge and converted it into the North Fork Hostel. He managed the Hostel with welcoming grace for nearly 30 years, providing comfortable and hospitable lodging for travelers from around the globe and a popular gathering place for North Fork events. He was an ardent outdoorsman, hiking the trails and camping in Glacier National Park and the Whitefish Range, navigating the lakes and rivers of the area, participating in Mountain Man Rendezvous events, and supporting a wide range of wildlife initiatives and wilderness proposals. 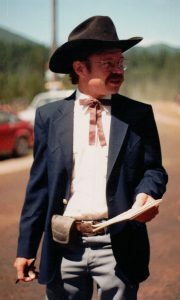 In 1982, he founded the North Fork Preservation Association to advocate against paving of the North Fork Road and to promote protection of the North Fork River from proposed coal mining operations in the Canadian Flathead. He served as president of the organization for nearly 30 years. NFPA annual meetings became a fixture of North Fork summer fare, with interesting and educational speakers. The NFPA also supported extensive trail maintenance and fire lookout preservation in the Hungry Horse Ranger District, as well as preservation of the Kishenehn Ranger Station in Glacier National Park. He served on the board of directors of the North Fork Improvement Association for many years. He was also a member of the North Fork Land Use Advisory Committee and a board member of the former Glacier National Park Associates. He served on the board of Headwaters Montana for many years, participated in the recent Whitefish Range Partnership, and was a member of numerous conservation associations and initiatives. From 1983-1985 John authored a weekly column about North Fork happenings in the Hungry Horse News. He inevitably served as announcer for the eclectic and unpredictable Polebridge 4th of July parade and earned the well-deserved honorific “Mayor of Polebridge.” He was a long-time member of North Valley Search and Rescue, and also helped found the Polebridge Irregulars fire-fighting team. 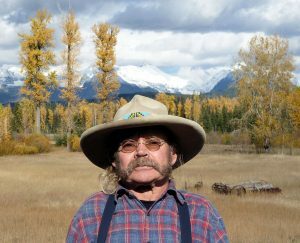 In 2014 he received a Conservation Achievement Award from the Flathead Audubon Society in honor of his 35-year effort to keep the North Fork wild. He will be long and well remembered for his soft-mannered yet persistent personality, his wry sense of humor, his dedication to environmental consciousness, and his tireless efforts in the interests of wildlife and wilderness conservation. He is survived by a sister, Bonnie Lee Hankey, of Harveysburg, Ohio, a brother Alfred William Frederick (Imaculada) of Tampa, Fla., and nine nieces, nephews, and grandnieces and nephews. Burial will be at Woodlawn Cemetery in Columbia Falls. Announcement of a celebration of John’s life will be forthcoming.